On the occasion of the General Assembly the VDMFK presented an international vernissage with more than 200 works on 4th of July. 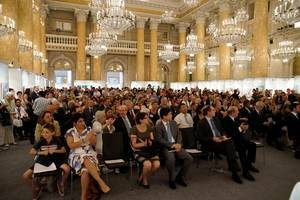 The event took place in the Hofburg of Vienna under the auspices of Austrian Federal President Dr. Heinz Fischer. The exhibition gave extensive insight into the current work of famous artists from 29 different countries. The grand opening in the Ceremonial Hall was conducted by the painter Prof. Herwig Zens and the Secretary-General of Amnesty International Mag. Heinz Patzelt. On the general assembly Serge Maudet was elected the 4th President of the VDMFK. In 1984 the Italian was elected to the association board for the first time. 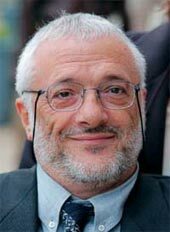 18 years later, on the occasion of the 9th general assembly held in Lissabon in 2002, Eros Bonamini was elected 3rd president of the VDMFK. He stayed successfully in his office until his death in November 2012. From 1st to 6th of October 2012 the VDMFK arranged an artists’ meeting in Taipeh, the capital of Taiwan. 62 mouth and foot painting artists from five countries took part in it. Taipeh served as the venue for another VDMFK artists’ meeting. 62 mouth and foot painting artists from Hong Kong, Japan, South Korea, Taiwan and the People’s Republic of China took part in it. In addition, many participants came from the VDMFK managing board. 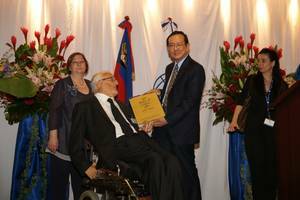 President Eros Bonamini could not take part for health reasons. Ruth Christensen from Denmark, Serge Maudet from France, Trevor C. Wells from England and Kun-Shan Hsieh from Taiwan travelled to Taiwan. 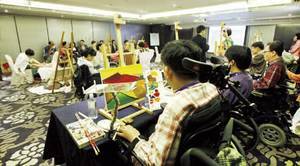 The central element of the artists’ meeting in Taipeh were the workshops for mouth and foot painting artists. All in all, they took more than 11 hours over various days. The instruction hours were attended by professors that showed different tips and tricks to the artists and helped them to improve their skills. The artists’ meeting in Singapore was accompanied by an international exhibition in the Sunctec Exhibition Centre. The exhibition was opened by Christopher Yeow, managing director of the ‘Very Special Arts’ Singapore Ltd. and Eros Bonamini, president of the VDMFK. The exhibition in the Sunctec Exhibition Centre in Singapore included 175 works by artists from all over the world. At the exhibition opening the association welcomed Christopher Yeow, managing director of the ‘Very Special Arts’ Singapore Ltd. In addition to the managing board of the VDMFK and the mouth and foot painting artists the opening was attended by public figures of Singapore. VDMFK president Eros Bonamini and Christopher Yeow, managing director of the ‘Very Special Arts’ Singapore Ltd., opened the exhibition by cutting a red ribbon. The international exhibition during the artists’ meeting in Singapore showed a total of 175 works of mouth and foot painting artists from all around the world. From 12th to 16th of April 2010 many artists came together in Mexico City to take part not only in the convention of delegates of the VDMFK, but also in the artists’ meeting for mouth and foot painting artists from different countries of South and Central America. All in all, the manager of the VDMFK welcomed 36 delegates from all continents plus 60 mouth and foot painting artists from Mexico, the Dominican Republic, Ecuador, Guatemala, Peru and Venezuela that took part in the meeting. Mexico City had already hosted an artists’ meeting in 1994 and had proved to be a suitable venue for such an event. In addition to a painting workshop that lasted for several days, important votings took place during the convention. Longtime board members Manuel Parrenõ and Trevor Wels were confirmed in their offices for six more years. Also the charismatic president Eros Bonamini got reelected. 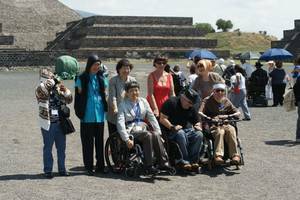 A collective trip to the temple complex of Teotihuacan made the week perfect. From 12th to 16th of October 2009 the Association of Mouth and Foot Painting Artists arranged an artists’ meeting in Buenos Aires. 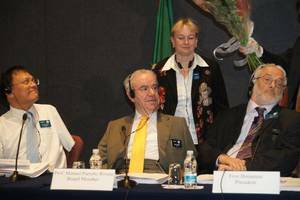 In its more than 50-year long history this was the first time the VDMFK visited South America. 69 mouth and foot painting artists from Argentina, Brazil, Chile and Colombia and the three board members president Eros Bonamini, Ruth Christensen and Serge Maudet came together in Argentina’s capital, Buenos Aires, to take part in the 7th artists’ meeting in the history of the VDMFK. This was the first time in its history that the VDMFK visited South America. It has always been important to the association to hold its meetings in cities of cultural significance – no doubt Buenos Aires is one of them. Due to the great number of full members, associate members and stipendiaries from South America it was necessary to split the artists’ meeting. 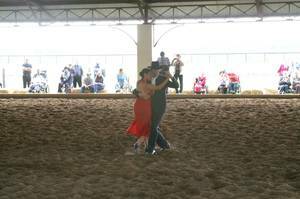 In that week, artists from Brazil, Colombia, Chile and Argentina were invited. The board had decided to arrange a second artists’ meeting for mouth and foot painting artists from South and Central America in April of the following year. In addition to the painting workshops the artists had various possibilities for exchanging their experiences, refreshing old contacts and getting to know new artists. The week was concluded by a collective visit to an Argentine cattle farm. The artists enjoyed their five days together with the managing board and the directorate of the VDMFK.